Lazio midfielder Sergej Milinkovic-Savic certainly put on a show for watching Manchester United manager Jose Mourinho this evening. The 23-year-old, who has long been linked with the Red Devils, pulled off an outrageous assist for his national team Serbia in their win over Montenegro. Watch the video below as Milinkovic-Savic flicks the ball into the path of Aleksandar Mitrovic to score his side’s second of the night. 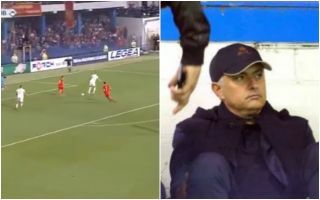 This skill shows just how talented Milinkovic-Savic is and why the Sun claimed recently that Mourinho would be at this game to scout the player in person, along with defender Nikola Milenkovic. With Paul Pogba struggling to hit top form this season, the Independent recently claimed Milinkovic-Savic was Mourinho’s preferred target to replace him. Don Balon have since reported that the Serbia international wants out of Lazio, who would likely ask for around €75million for his signature.